DIY investing requires experience and investing knowledge. It can be time-consuming and require you to do extensive research and analysis on financial markets before you choose your investments – not just once, but on a regular basis. If you’re not careful, fees and charges can add up quickly when DIY investing, and there could be hidden charges for things like withdrawing your money. 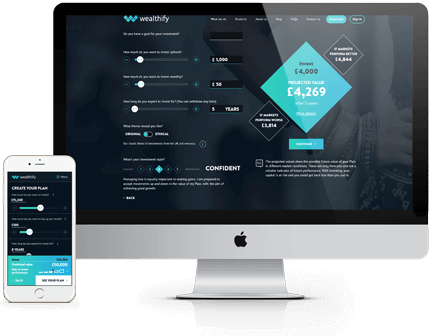 Robo-investing services like Wealthify offer a simple alternative. You don’t need any previous investing experience and there’s no need to do any research, because our experts do all the investing for you while you get on with your day. They monitor financial markets every day and adjust your investments if necessary, to keep them on track. You can check your plan whenever you like, to see how its performing and view the investments you hold, and top up your money at any time, or withdraw it whenever you like, if you need to. In return, you pay a simple annual management fee of no more than 0.7% that covers everything we do, so there’s no surprises. A small additional fund charge and transaction cost also apply and are detailed on our fees page.